Severus Alexander. AD 222 to 235. Denomination : Bronze sestertius. Mint : Rome. Size : 28.1 x 29.9 mm Weight : 20.03 grams. Grade : VF with good smooth surfaces and a dark brown patination. 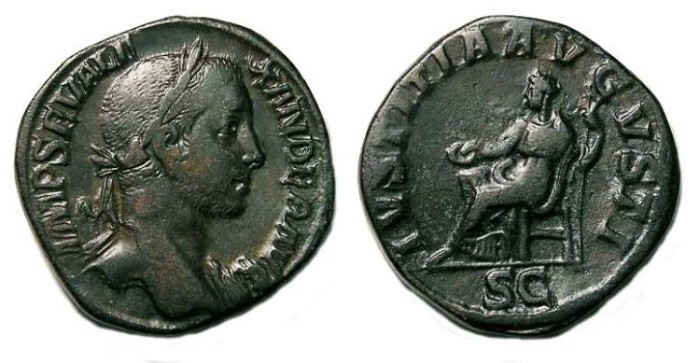 Obverse : Head of Severus Alexander right, with IMP SEV ALEXANDER AVG around. Reverse : Justitia seated left holding a patera and sceptre, with IVSTITIA AVGVSTA around and S C below.